I am posting some designs I did for a Threadless Challenge to redesign 12 college mascots. I only got around to 2 but I like how they turned out. 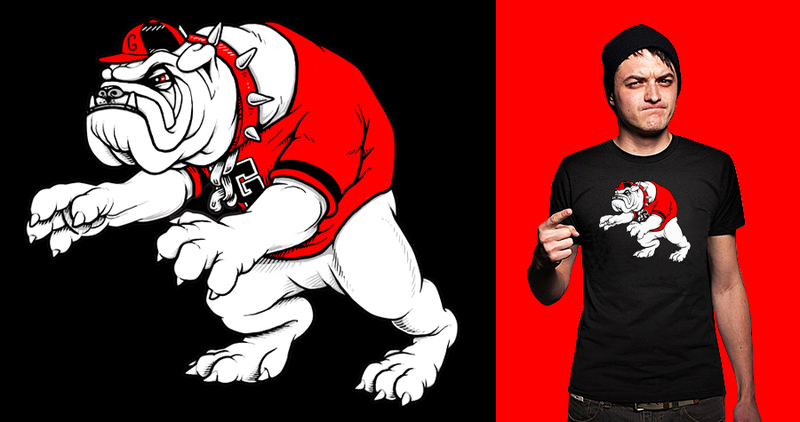 I have always been bothered by the commonly seen Georgia Bulldog mascot I see around town in Athens, GA. I wanted to make a cool and aggressive bulldog to contrast the poorly drawn goblin-looking mascot. I used actual bulldog images, the idea of a full-bodied mascot (which many other colleges embrace), a ready to pounce football player, and the Rancor creature (from Star Wars) as inspiration for my design. 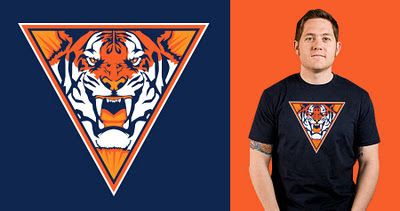 For Auburn I strove to use the concept of their established logo/mascot and take it to the next level. Their logo is circular and I used angles to create more aggression. I also used more of the tigers face to further intensify that aggression. For this design I used actual Tiger images, super hero emblems, an almost symmetrical triangle (and the space it creates), and the current Auburn logo/mascot for my inspiration. Where can I get this as a t-shirt/if they're no longer available, can I make one on my own?